Together we build better planes! I came home from the spring fling in late May with some ideas on how to improve my oil cooling by moving my oil cooler from the fire wall to under the engine the way the RevMaster installation is. This took longer than expected and I did not get back in the air until early Sept.
On a nice Thursday morning I made a flight that had to be cut short due to a low battery. I mention this because I made a nice landing indicating I still remembered how to land my Q2. The following Sunday was another nice day so I went for a flight to test my oil cooler. Everything went great. My oil temp never got above 195 degrees and at cruise it was 165 degrees. These temps indicate I may have been too successful but that is for another issue. After about an hour I headed back to Epply Airfield. Field elevation is 1000 foot and I stayed at 2500 as I approached the field. I was instructed by the tower to cross over midfield and enter a left downwind for one eight. I maintained my 2500 foot altitude because I had thought that if I ever had an engine out issue I would have a cushion to make the airport. This is the first factor that lead to my mishap. I have heard that it is no one issue, but a trail of issues that lead to an accident or mishap. As you will see, this is true in my case as well. Just as I was crossing midfield, the tower cleared me to land on 18 and then said "Keep your approach tight." I was immediately apprehensive with this but thought to myself that this would be an opportunity to see if I could do this as runway 18 is an 8000' long runway. I had in the back of my head that I might have to do a go around if my execution of this landing was not going well. Somewhere along the way, I forgot to do this. So, I made my turn to downwind and began to slip to bleed off some altitude. I turned to base at the end of the runway. In hindsight I probably didn't need to make my approach this tight. I slipped more on base and turned to final. I deployed my belly board at this point as well. When I came out of my turn into final, I could see I was still too high. And began my final series of mistakes. As I look back I should have made the decision to go around at this point, but I then started slipping again and pointed my nose down to "get down". I had tried this before and it doesn't work, so why I continued, I haven't a clue. It's like someone in the back of my head was saying "You have 8000 feet to land and you ought to be able to do this." So I continued to try. I also trimmed my nose down with the reflexor like I always do on final. As I recall my sink rate was over 500 feet per minute. At one point I put in some throttle to kill my rapid sink rate which it did. I looked over the nose and felt I was running out of runway, but for some reason kept thinking I had enough to finish this landing. Of course hindsight says this was another missed opportunity to initiate a go around. I kept going. I then was "close" to the ground and I pulled the power to idle and I dropped out of the air and bounced hard. I wish I could tell you what my airspeed was, but I can't because my eyes were looking outside. I bounced a second time and I knew I had had enough and I applied full power to do a go around. Things went from bad to worse at this point. Even with full power I was only a few feet off the ground and not climbing. Let me tell you, the approach lights at a large airport are a lot taller than you might think. And they were coming up fast. I drifted to the right to avoid them and saw a fence, trees and not so far in the distance was a railroad bridge. I think I said out loud "I'm going in". Survival mode kicked in. I had full aft elevator. I looked at the airspeed and it was 80 mph. I knew I had to get some airspeed to climb. But I didn't dare let up on the back force on the stick or I would go in. I thought "what the hell is wrong? Why am I not climbing." I scanned the cockpit and saw my reflexor was still trimmed for nose down. I quickly re-trimmed to neutral. My nose came up! I was able to release some back pressure on the stick. I did another scan of the cockpit and saw my mixture was not at the full rich setting and pushed it in. This gave me 150 to 200 more rpm. Then I leveled off not much above tree tops to gain some speed. It took courage to do this, but my training told me I needed airspeed before I tried to climb. I soon saw 90 mph then 110, and when I reached 120 mph, I started a slight climb. Somewhere in here the tower called and asked me if I was going to get enough altitude to return to the field. I answered "I'm trying". Just after I started this slight climb I noticed things were shaking. I immediately knew I must have hit my prop on the hard bounce. I would describe the shaking as somewhat "mild", similar to what a missing engine would shake like. Because I had the expected rpm coming from the engine, I attributed the shaking to a prop strike. With enough altitude I began a slow turn back to the field. The tower called and said I was cleared to land on 14 left. I acknowledged him. I then though about it. It was a long way around the patch to get lined up to 14 left and I had a broken prop. I called the tower back and asked if I could have 32 right which was staring me in the eyes and the wind was 100 at 8 knots which I thought was ok under the circumstances. He said I could have any runway I wanted. (That was nice of him). He cleared me to land on 32 right. I executed a great landing! I looked down to discover my belly board was still deployed. I had never pulled it up during the go around! That would have helped my climb rate just a little! I looked over the prop and amazingly it still had its full length. The last 1/4" of the tip was still there but bent in the direction of the prop rotation. 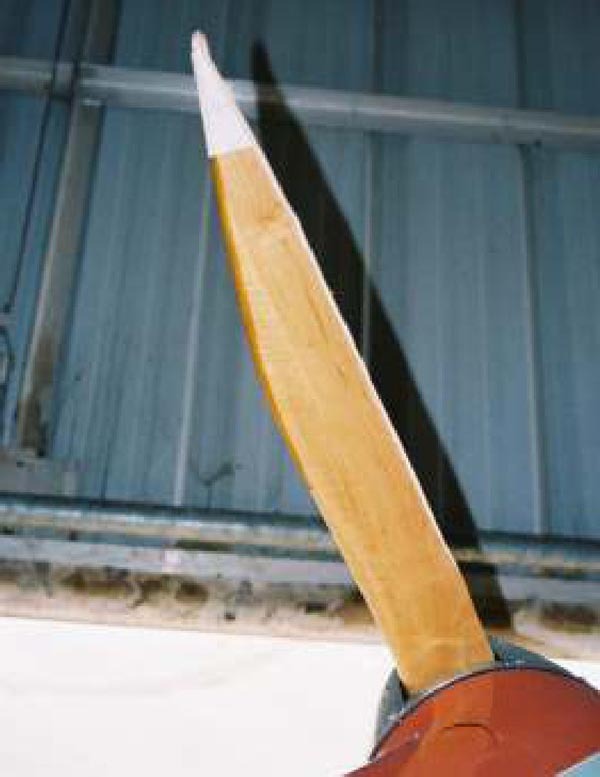 However, approximately 1" of the back side of the prop had splintered off of BOTH blades from the tip to the hub! I still had a prop, but it was neither efficient or balanced. It got me safely home though. Then my heart went to my throat when I saw the wrinkled skin just outboard of the fuselage on the top of the passenger side canard. Again, I was disgusted with myself for making such a stupid mistake. Then I got on my knees and thanked God I was alive. I put the airplane away with only a short inspection of further damage and found none. I knew I would have plenty of time to inspect it more on a later date. I just wanted to go home. When I got home I made two phone calls. One to Dave Richardson and and one to Sam Hoskins. I wanted to hear a familiar voice to say everything would be ok. Sam called back first and the phone conversation did what I expected from it. Sam reassured me that I would fly again. The Sullivan Field of Dreams fly-in was a week a way and I told Sam I didn't think I could bring myself to go. He reminded me I was the newsletter editor and I had to go. He said "Bring your prop and photo's and we'll discuss the repair". Dave called back as well and gave me further reassurance that I would fly again. In the end, I did go to Sullivan. Sam was right. It was as if I had gotten back on the horse that had just thrown me. I felt better. And to my surprise, I had no less than three people thank me for telling this story at the Quickie forum. The cold weather has slowed my repair down, so I'll address my progress in a future issue. Be safe and know your skill level! 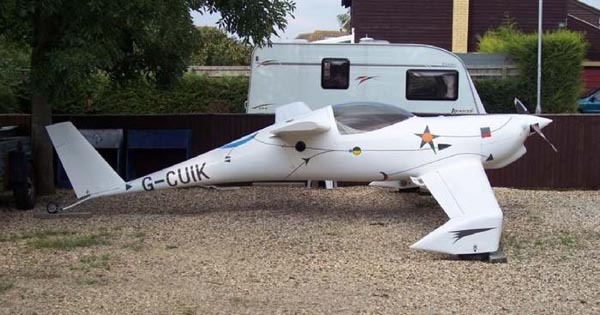 Chris Rayner's Beautiful Q-200 G-CUIK in Faringdon England. You can order a printed copy of Q-talk #114 by using the Q-talk Back Issue Order Page.